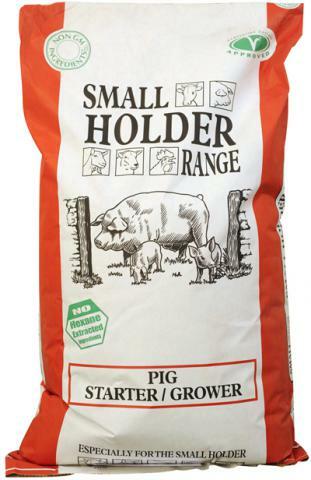 All feeds in the Small Holder Range are approved by the Vegetarian Society and are free from animal by-products. We only select the highest quality vegetable oils and the vitamins we use are not covered in the traditional gelatine coating. Only products formulated without genetically modified ingredients are approved by the Vegetarian Society. Provides a complete feed for free range hens, through fresh vegetables or mixed corn may still be fed in the afternoon as a treat. This feed provides all the vitamins, minerals (including Calcium) and natural ingredients needed for a good sized egg with a natural golden yolk colour. Feed all year round, on a free access basis. An average hens will eat 100-150g (4oz) per day. As the hen's crop can only hold about 100g it is best to give grain or mixed corn separately, later in the day, or she will be unable to eat sufficient pellets or meal. Meal may be fed wet or dry, depending on preference. 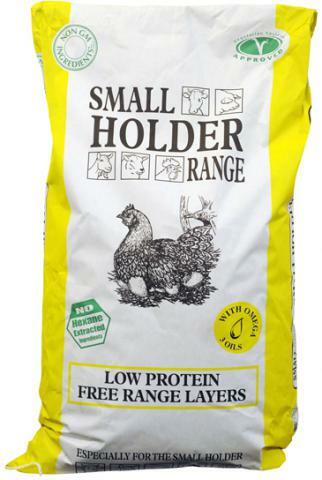 The Small Holder Range has been based on many years of scientific and practical research into the needs and feeding requirements of Small Holder animals. Along the way we have gathered much information about the best practices of feeding, maintenance and healthcare. Below you will find brief summaries and links to many articles that we believe will be of help in your animal husbandry. Feed to young chicks as soon after hatching as possible. Should be fed through until the chicks are 6-8 weeks old, and can be fed on a free access basis. In the week before changing to Poultry Grower Pellets, it is preferable to mix the crumbs and the pellets to ensure a gradual changeover. May also be fed to ducks or geese in an emergency (i.e. when Goose/Duck Starter Crumbs are unavailable) though in general you should be very careful about feeding chick crumbs to to ducks as some companies' products contain an anti-coccidiostat which can be harmful to them. 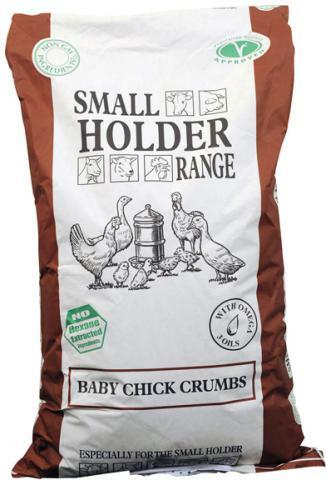 If feeding quail, game or turkey chicks we suggest using Smallholder Range Turkey Starter Crumbs, or if you have any further queries please contact our Helpline on 01362 822902. For the truly free range bird. Lower protein levels can result in less nitrogen pollution of the soil. 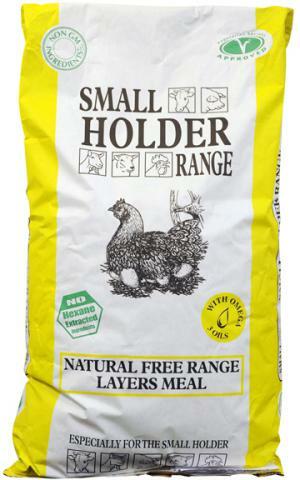 Provides a complete feed for free range hens, though fresh vegetables or mixed corn may still be fed as a treat in the afternoons. This feed provides all the vitamins and minerals (including Calcium) and natural ingredients needed for a good sized egg and a natural golden yolk colour. 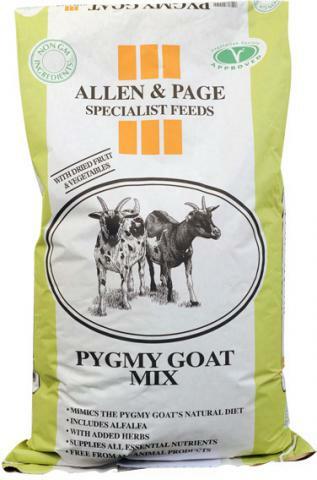 Feed all year round on a free range basis. An average hen will eat 100-150g (4oz) per day. As the hen's crop can only hold about 100g it is best to give grain or mixed corn separately, later in the day, or she will be unable to eat sufficient pellets. 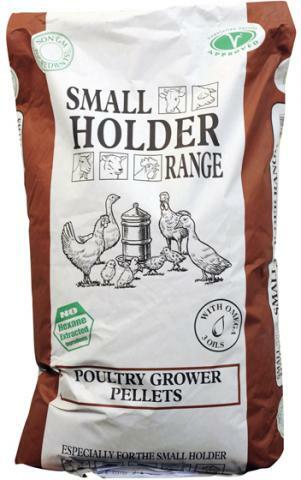 Equestrian & Farm feeds supply the full Small holder range. If the product you desire is not in stock we will order it in for you. Please ring us just to make sure we have it in stock. Higher fibre levels and dried fruit and vegetables mimic the goat's natural diet as closely as possible. 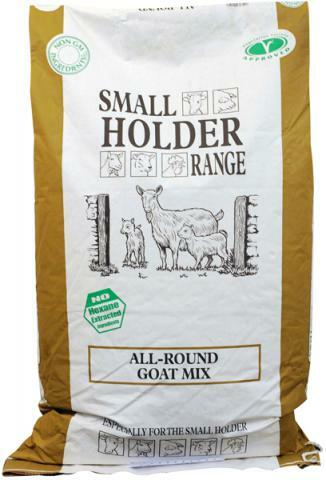 Suitable for all mature goats including pets, fibre goats and Golden Guernseys. Specially formulated to avoid obesity. 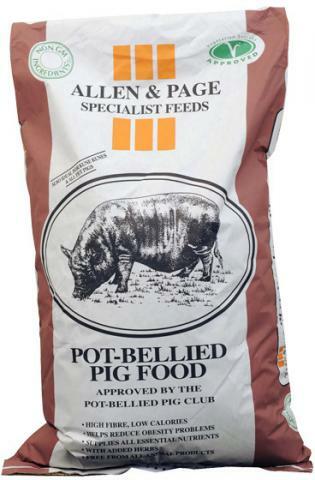 Suitable for Kune Kunes and all pet pigs. Feed from 5-16 weeks. Contains no artificial growth promoters, made from only the highest quality ingredients. Mix with Turkey Starter Crumbs initially for a smooth changeover. Feed from 5 weeks onwards. They can be fed to appetite to growing birds and for those being reared for meat, they may be fed right up to finishing, with or without wheat from about 12 weeks. 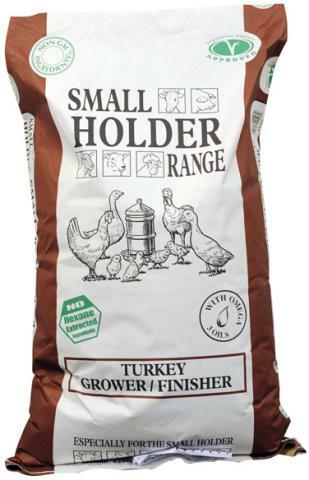 Alternatively Poultry Grower/Finisher may be used as a finishing feed. A high protein, high energy pellet for breeding birds. Excellent for rare breeds - especially good for hybrids. Has high levels of vitamins/trace mineral/amino acids for improved fertility and egg quality. Contains herbs known to assist breeding. Contains a blend of oils (soya, linseed and maize) to ensure a balance of Omega 3 & 6 oils (good for plumage). Should be fed from 6-8 weeks onwards, and may be fed to appetite. Restrict the feed or mix with wheat to slow the growth rate. 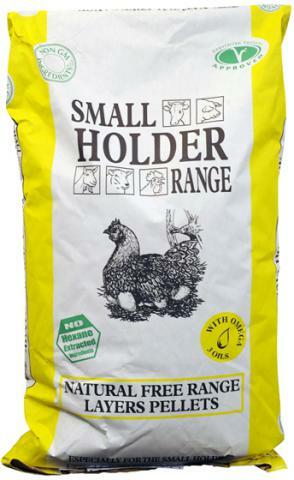 For birds that are to be kept as laying hens, introduce Natural Free Range Layers Pellets from 16 weeks. Available in 20kg and 5kg bags.